← Will “Go Fast, Go Hard” On Offense Put an Added Strain on BYU’s Defense? 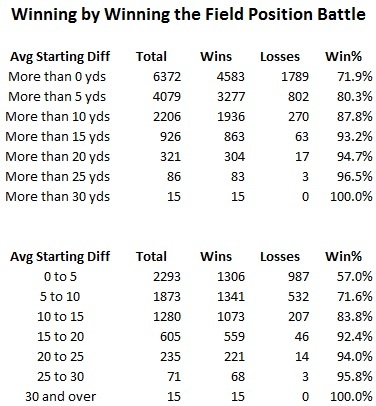 How Much Does Field Position Matter? Last week, starting cornerback Jordan Johnson tore his ACL while practicing kickoff returns. Bronco Mendenhall explained that he had Johnson returning kicks because of a study that showed how much impact winning the field position battle had on wins and losses. Unfortunately, Bronco neglected to share any of the specifics of that study with the media. Well, in order to fill that information vacuum, Cougarstats has done its own research. Of 6,372 games played between 2005 and 2012, the team that won the field position battle (i.e. their average starting field position for each drive) won 71.9% of the time. Even if the battle was won by less than 5 yards, the odds of winning are 57% and the win percentage increases fairly rapidly with additional yardage. Of course, starting field position is due to a large number of factors of which punt and kickoff returns are only a part. Drives begin after a kickoff 41.0% and after a punt 37.7% of the time, for a combined 78.7%. However, many kicks and punts are not returned. Drives beginning after a kickoff RETURN or a punt RETURN happens only 39.0% of the time, so even if you increase your kick return average 5 yards, it will improve your average starting field position by about 2 yards. So was the reward worth the risk of injuring one of the more irreplaceable players on the BYU defense? You be the judge. Possibly. The NCAA data on ACL injuries says there are 4 injuries per 10,000 scrimmage plays. So the risk was very low.